While we haven’t given up on cost/share funding to acquire the ll.l adjacent acres of prime ag land through the State Legacy Lands program, the state budget situation doesn’t look promising for funding. Thus we would like to explore private funding sources. Our Malu ‘Aina supporters have already pledged $70,000 toward the purchase price of $250,000. The present owner, David Fukumoto, is willing to split all closing costs as part of a donation. That still leaves us about $l80,000 — $l90,000 short. l. Can you help with grant writing ideas and/or with suggestions of possible grant writers to assist us in this effort? Our Legacy Lands Application is available on the web at http://hawaii.gov/dlnr/dofaw/llcp so a grant writer doesn’t have to start from scratch. 2. Another matter of concern is finding younger people to carry on the work. We need a key person or two as konohiki to shepherd this effort to involve others in growing and training grassroots people in organic food growing. I see my role to help secure the adjacent land and as a mentor to the next generation of Malu ‘Aina farmer/activists. But we need younger people to carry this forward as stewards of the land and as Board members of our non-profit organization. Please send any young people to visit Malu ‘Aina who may be interested in carrying the torch. Mahalo for any help you can provide on the above two points. Your passion and commitment to the ‘aina and future generations is much appreciated. Press Statement – Nov. 19, 2009 — Malu ‘Aina stands in Support of Ohana Ho’opakele and a Model Pu’uhonua at the site of Kulani prison. Malu ‘Aina supports Ohana Ho’opakele’s vision for a model Pu’uhonua at Kulani Prison where the traditional process of ho’oponopono (to make right) would be used along with other restorative justice methods to to help repair the damages of crime for offender, victim, and all those affected by crime. Keep Kulani minimum security prison open and functioning. Do NOT close it. Let Ohana Ho’opakele work with Department of Public Safety (DPS) and Kulani staff, and other community organizations to build a functioning Pu’uhonua at Kulani. No Military training at Kulani by the State Department of Defense or the U.S. military. Malu ‘Aina believes that a Pu’uhonua (a place of refuge and healing) is a constructive alternative to the western concept of prisons and punishment which has proven not to be working to reduce recidivism. Nor does prison heal the victim or offender and all those affected by crime. Kulani is an ideal site for a Pu’uhonua in conjunction with keeping open the minimum security prison. Kulani is a place of spiritual significance. It’s peaceful forest setting is a natural place of refuge. It has existing infrastructure and trained staff that genuinely care about the welfare of the prisoners. Kulani has the real potential for economic self-sufficiency, as demonstrated through past activites which is very important in these hard economic times. 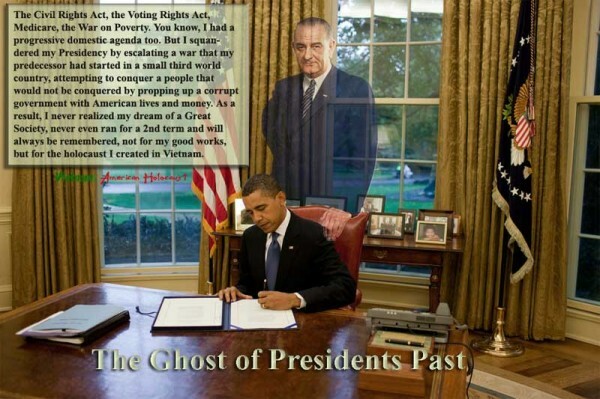 Let us remember history and President Lyndon B. Johnson. Stop the Wars! End U.S. Occupations!